Most people take access to a GP for granted but if you become homeless, it’s not always so easy. We look at one project helping to raise awareness of your rights when it comes to registering with your GP. 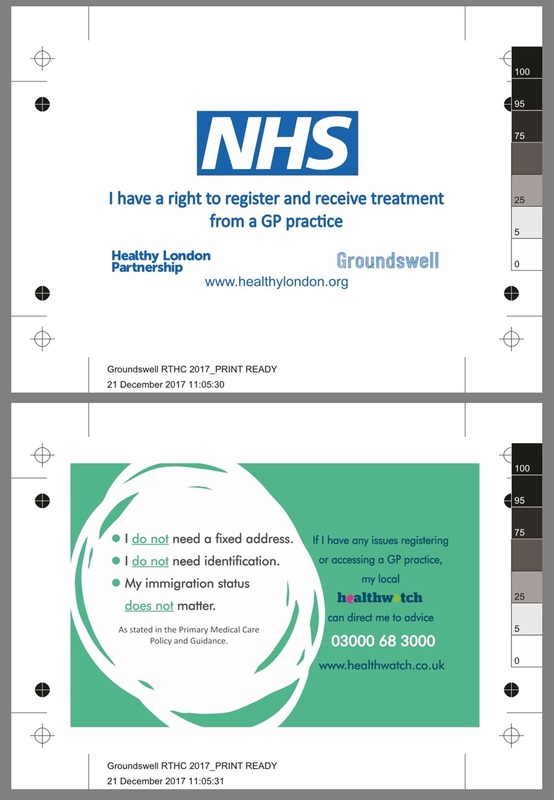 click on this link to download a card: http://groundswell.org.uk/wp-content/uploads/2018/01/Groundswell-RTHC-2017_PRINT-READY.pdf and please visit http://groundswell.org.uk/what-we-do/health/my-right-to-healthcare-cards/ for more information and guidance on the my right to healthcare cards. In this guide we provide practical information on when sheltered housing, assisted living and extra care sheltered housing may be suitable for your relative, the features and facilities they offer, and the renting and buying options. Sheltered housing or sheltered accommodation is designed to help (mostly) older people to live independently knowing help is at hand. Extra care sheltered schemes can support dementia sufferers. This is an option if your relative’s home is no longer suitable for their needs or if they will feel safer and more secure with more people close by to offer help and company, while still living independently. Sheltered housing has self-contained flats or bungalows with a manager on site and a 24-hour alarm system. Extra care sheltered housing offers more support with personal care, sometimes for people with dementia. Local councils, housing associations and some charities such as Abbeyfield offer sheltered housing for those with limited resources. The key benefit is the freedom to live independently knowing help is available. However, most schemes do not offer medical care and the cost is higher than living with family or friends. Use these lists to check the practicalities, costs and legal issues when choosing sheltered housing. It is possible to buy sheltered accommodation or rent it privately. We look at how to do this, protection for buyers, choosing a reputable supplier, checking charges and issues for tenants. We explain the additional costs such as service charges, ground rent, the reserve fund, what bills your relative may incur, plus transfer and permission fees. Here are some useful contact details for those that find themselves sleeping rough or in need of help from their local authority. Are you sleeping rough in London tonight? If you think you will be sleeping rough in London tonight, here are some places you can look for help. Going to the council In order to get housing advice, and understand what help your local authority may be able to offer, you should visit the housing team at your local council. Find out more about how to get this type of help by using our advice guide Getting help from your local council. Going to a day centre You can often get practical help from a day centre for homeless people, this can include things like meals, showers, benefits advice and housing support. Day centres will often have information about how to get a referral into a hostel. You can find a day centre near you by using the Find Help directory on the Homeless London website (www.homelesslondon.org), and searching for day centres for homeless people in the area where you are. Getting into hostels Most hostels will only take you if you have a referral, so it is important that you try to get a referral as soon as possible, whether from your local council, a street outreach team, or any other agency. All the accommodation listed on the Homeless London website contains details of how you can get into the accommodation and where you need to get a referral from. Direct access hostels Very few hostels will take someone without a referral. The list below contains links to the few hostels in London where you can go without a referral. Please be aware that hostel spaces get filled up quickly, you should contact the hostel first to see if they can accommodate you. Irish housing centre – St Louise Hostel, 020 7222 2071 (women only) Missionaries of charity - Home of Peace, 020 8969 2631 or 020 8960 2644 (women only) (You can also search in our Find Help directory on www.homelesslondon.org for day centres for homeless people which may be able to provide you with information). 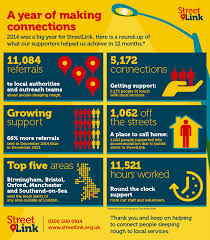 StreetLink StreetLink is a new service designed to help connect rough sleepers to local services. You can find out more about StreetLink, and refer yourself for help if you are sleeping rough, by visiting www.streetlink.org.uk or by calling 0300 500 0914. (This is not an emergency service). There are also some hostels that open specifically in winter to help rough sleepers during the cold weather.Most shelters will require some form of referral from the council, outreach team or a local day centre. Visit the Winter Shelters advice guide on www.homelesslondon.org to find out how to access this type of accommodation. If you are not in London, you can search for help and support using www.homelessuk.org. Homeless UK can tell you about services for homeless people and people at risk of homelessness anywhere in the UK. You can search the site by postcode, local authority, and location, as well as by type of organisation. If you are sleeping rough, you can also contact StreetLink, using the details above, to get connected to services that can help you. Are you over 18 and need help finding accommodation? If you are sleeping rough, you can also contact StreetLink, using the details above, to get connected to services that can help you. If you are experiencing harassment, domestic violence or ill-health, it is possible that you may be considered in priority need for housing by your council – though many single people are not. You can find out more about if your council can help you by using our Getting help from your council advice guide, or use the numbers listed above to contact your local council. You can also search the Find Help directory on www.homelesslondon.org for local housing advice and day centres, or contact the free housing advice Line run by Shelter on 0808 800 4444 (free, 8am – 8pm weekdays, 8am – 5pm weekends). For support and guidance for a range of other issues, here are some useful organisations you can contact. The organisations below support a range of issues, but if you are at risk of homelessness tonight or the near future, find out here how Alone in London can help. Mental health helpline providing information and emotional support to anyone affected by mental health issues. Information, support and signposting service on sexual health, contraception, pregnancy and abortion. Really useful information for young people on all aspects of heath care and resources to support emotional well-being. Free and confidential emotional support service for young muslims. Accommodation and support for women who have been trafficked into prostitution. Advice for anyone concerned about drugs or solvent misuse. Information and advice on legal rights, counselling and support services for lesbian, gay and bi-sexual people. Are you homeless or about to be made homeless? Ask for help as quickly as possible. Call Civil Legal Advice on 0345 345 4345 for free legal advice, if you are eligible for legal aid. Shelter's helpline is open 8am–8pm on weekdays and 8am–5pm on weekends, 365 days a year. Our housing experts will offer support to you no matter what your housing situation. Calls are free from UK landlines and all major UK mobile operators. Other networks may charge. You can also talk to a Shelter adviser face-to-face. Find your nearest Shelter advice centre. Shelter has 14 advice centres in England where you can go to get personal, face-to-face advice from a housing expert. Our solicitors help anyone eligible for legal aid with free, confidential legal advice. Please call for more information or to make an appointment. To speak to someone about your nearest face-to-face centre, call the Shelter Support Helpdesk on 0300 330 1234. Our Advice Services Directory lists details of advice services by region, including Citizens Advice, independent housing aid centres and council offices. Nightstop and similar emergency housing schemes for homeless young people aged 16 to 25 can provide free, safe, supportive and welcoming environment in the home of a volunteer. Stays can be anything from just one night to a few weeks. A stay in one of these schemes can help with sudden homelessness. Many young people using the schemes have been asked to leave their family home, or have left home suddenly when they have fallen out with a family member, or have left a hostel, and would otherwise risk sleeping rough or sofa-surfing. A scheme won't usually be able to help if you have a recent history of violence, arson or sexual offences, or a serious criminal record, and may not be able to help if you have health or other issues that they can't support. However, there may be other agencies who can help you. Use the Homeless UK services search to find local advice and support. Nightstop schemes are typically run by charities and coordinated by the national charity Depaul UK, which sets standards for the schemes. There are about 40 Nightstop schemes in the UK, but not in every area. Crashpad schemes or Supported Lodgings schemes run by other charities or local councils may also provide emergency short-term help. The schemes check and approve the hosts offering their homes to young people to make sure they are safe places to stay. Use Shelter's directory to find a local adviser to check which schemes are available in your area. Find out if there is a Nightstop scheme in your area by checking for schemes on Nightstop UK. Search for Nightstop and other similar schemes on Homeless UK. Shelter's helpline – 0808 800 4444 (8am to 8pm Monday to Friday, 8am to 5pm at weekends). Many of these organisations can tell you how to get referred to a scheme, advise you on your longer-term options or on other help that may be available in your area if you can't get a place to stay through a Nightstop or similar scheme. The information you give to any of these organisations is usually just between you and the person you speak to. They won't tell anyone else unless you agree to it or you are in danger. When you are referred to a Nightstop or emergency housing scheme, you are asked about yourself and your situation. If the scheme finds you a place to stay, you get a room to yourself, the chance to have a bath or shower, wash your clothes, have an evening meal and breakfast the following morning. You also have the company and support of your host. You may be able to stay for a few days to a week or more, but sometimes the stay is just for one night. Each Nightstop scheme has a pool of volunteers, so you may have to move from the home of one volunteer to the home of another. The Nightstop scheme arranges this. During the day, you are not usually allowed to stay in the volunteers' home or leave your bag or belongings there. Nightstop and similar schemes usually work with you to find longer-term solutions to your housing problems. This may include helping you and your family sort out your difficulties through family mediation or finding you a place in a hostel or foyer for young people. To find out more about what Nightstop schemes are like, view videos from Depaul Nightstop UK. Works to transform the lives of people suffering the effects of homelessness and exclusion in Hillingdon and Hounslow. Provides supported housing; opportunities for learning, training and qualifications; and opportunities to secure a living wage. Literacy and numeracy programmes. visit the pavement's brilliant website for more information.